It's no surprise that the so-called Mississippi Baby was a hot topic at an international gathering of AIDS experts. Earlier this month, the world learned that the child, thought to have been cured of HIV after her July 2010 birth, had detectable levels of the virus in her blood. Quick as a heartbeat, “cure” was downgraded to “remission.” For many, hope for battling the virus was downgraded, too. 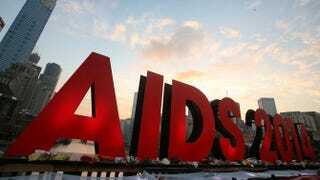 But on Monday at the International AIDS Conference in Melbourne, Australia, discussion of the development was more hopeful than one might have expected. At a special press event, “Toward an HIV Cure,” a group of scientists insisted that the case of the baby—now a little girl—was less a setback than a way forward. Experts also pointed to several new studies that offered information that might lead to hope for a cure. The virologist involved with the treatment of the Mississippi Baby, Dr. Deborah Persaud, also an associate professor of pediatrics and infectious diseases at Johns Hopkins Children’s Center, called the case “a major step forward.” After all, she said, the length of time the baby’s virus stayed under control without treatment (27 months) set a medical record. The baby was born prematurely to an HIV-positive mother who was unaware until delivery that she had contracted the virus and did not receive anti-HIV medication during pregnancy. Immediately after birth, the infant was treated aggressively and continued on medication until she was 18 months old, when doctors lost contact with mother and child. But when medical staff saw the child five months later, they could find no trace of HIV. She remained virtually free of the virus for more than two years. The three new studies outlined at the press event produced mixed results, but all of them, including the Mississippi case, point to a latent reservoir of HIV that makes the devious virus hard to combat. One study, conducted on monkeys, indicated that HIV reservoirs form even before the virus can be detected in the blood. There, according to investigators at Beth Israel Deaconess Medical Center, HIV can lie dormant and avoid being killed off by anti-AIDS medication. The study was published on July 20 in the science journal Nature. Another study examined the size of the reservoir using a novel measure. And a third explored the use of a drug to “kick” or “shock” the virus out of the reservoir, where it can hide. This study, released on Tuesday and conducted at Aarhus University Hospital in Denmark, excited the audience—though lead researcher Ole Schmeltz Søgaard called his work “a small step." Read more about the International AIDS Conference at the Black AIDS Institute.